The influence of muscle forces and vectors on mandibular position cannot be limited to the masticatory muscles alone. Cervical and Postural muscles also play a role. An ideal erect posture is a line of gravity down the midline of the following bilateral points: the center of the mastoid process; the point just anterior to the shoulder joints; the point through the hip joints; the point just anterior to the center of the knee joints; and the point in front of the ankle joints. The head will attempt to maintain a posture with its center of gravity midway between the mastoid processus. The maintenance of this center of gravity is essential for the optimal neuromuscular function of the masticatory muscles. The suprahyoid, infrahyoid, posterior cervical, anterolateral cervical, anterior cervical and other cervical/upper thoracic muscles play a major role in maintaining head posture and coordinating mandibular function. Together, a finely coordinated, dynamic balance of cervical and cranial muscles determine mandibular movement. Patients with cranio cervical and postural issues often exhibit high EMG readings in some of the muscles even after 45 minutes of Myomonitor application. In some cases the EMG readings may actually increase. This may be the result of nociceptive input emanating from cervical/postural muscles that passes through the caudate nucleus of the trigeminal ganglion and affects the masticatory muscles. Failure to recognize the postural issues and muscle tension in the cervical-upper thoracic area can have a negative impact on arriving at an optimal and stable occlusion and can result in relapse of the treated TMJ/MSD patient. If nociceptive areas are not relieved of pain and spasm, they refer pain to other sites. A myofascial trigger point (TP) is a hype rirritable locus within a taut band of skeletal muscle tissue and the associated fascia. Active trigger points may refer pain to masticatory muscles. 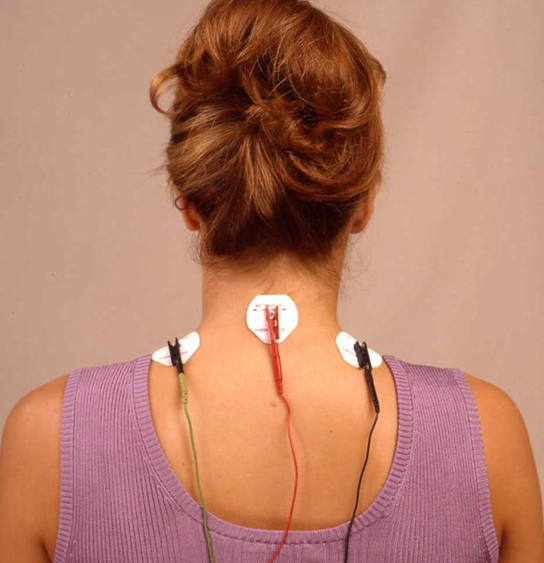 By placing the electrodes over the upper trapezius muscle (a common trigger point site), the stimulator can relax the upper shoulder and cervical muscles, leading to a more effective occlusal evaluation and subsequent bite registration. The J5, a four-channel ULF TENS unit, allows the clinician to effectively relax the masticatory and cervical/ postural muscles through the simultaneous stimulation of all the muscles that maintain mandibular rest and head posture and thus aids clinicians to successfully perform a bite registration procedure. The J5 stimulates these muscles through neural mediation and by direct stimulation. The patient is pulsed for about 45 minutes with the J5. Just prior to starting the bite registration procedure, the clinician turns off stimulation to the cervical/thoracic muscles and follows standard optimizing bite registration procedure as with the J4.